Here’s some screenshots I whipped up this morning. 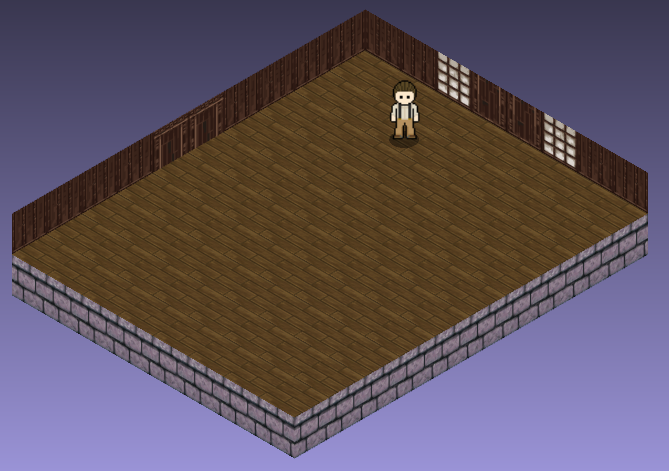 It is to show off the fact that I am using 3D meshes for background scene objects. 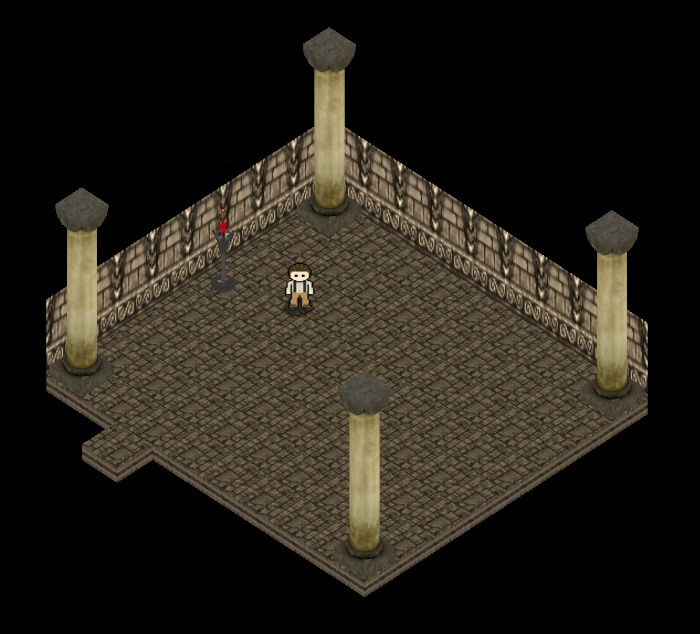 Right now I’m using some objects I got for free from Reiner’s Tiles. Excellent website by the way; great stuff for when you need some basic stock objects or placeholder art (actually the license on this site lets you use it for final commercial projects as well!). ANYWAY, the scene in these shots is a crypt room with some 3D objects. There are some columns and a torch. For the torch I have a basic fire particle effect (it DEFINITELY needs some work though). It has some basic flames and embers with simple behaviour. 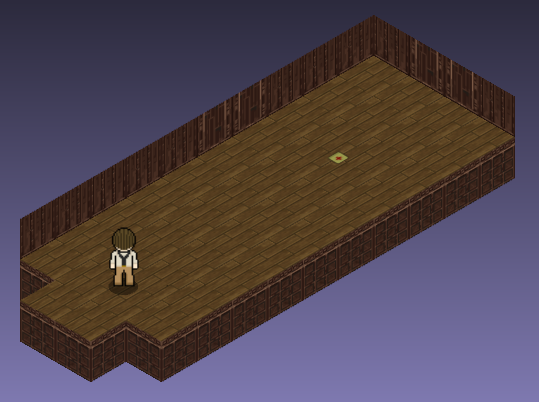 The second image shows the room rotated at an angle just to prove that I’m using 3D objects. Zombie Mansion: Updates and screenshots! Yay! Screenshots! I’ve finally had some motivation to post some stuff on my project that isn’t 6 months old. I got a little side tracked with events and stuff, so I’ve been busy and unmotivated. Anyway, I’ve solved the issue I was complaining about in my last post, or at least I have a workaround for it, so it looks nice again. 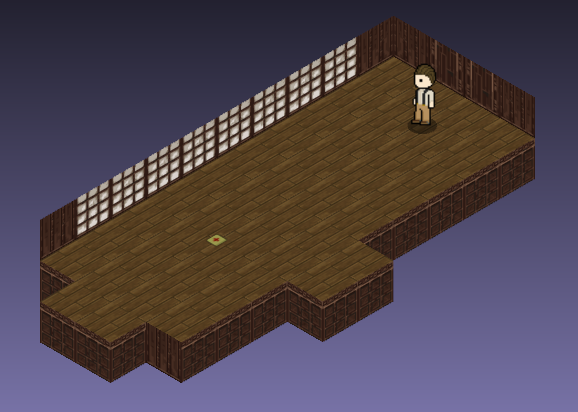 Also, I’ve been using Artisy: Draft for piecing together level designs and other stuff. It makes it a bit easier when I go to make levels in my editor if I have a fancy map telling me where to put stuff. Anyway, here are some animated GIFs of my “game” right now. Note that they don’t really look right due to the GIF making process I’m using. For example, the animations and movements look really glitchy (and the particle effects die out) because the framerate dies when I record a GIF with the library I’m using. 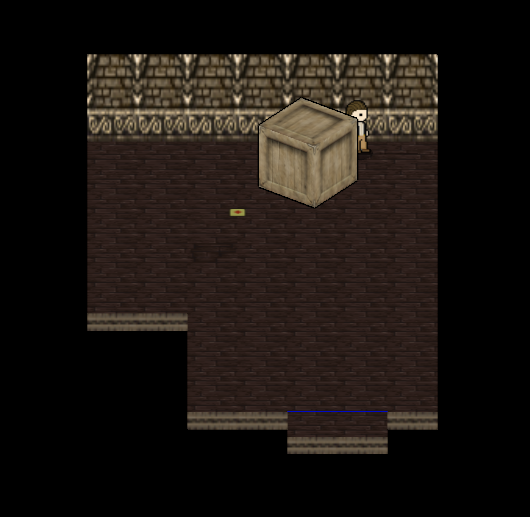 Also, the levels depicted in the GIFs are not finished and polished, so the floors look awkward, etc. So here’s a screenshot I took this morning before leaving for work (I’ll try to get a bigger set of them this weekend). It shows some of the new features, although not all of them are obvious. The biggest new features is the walls that only face forward. This means that you can only see the back walls of the room, and the front ones disappear automatically depending on the camera view. If you rotate the camera around then the scene will fix itself to this effect. 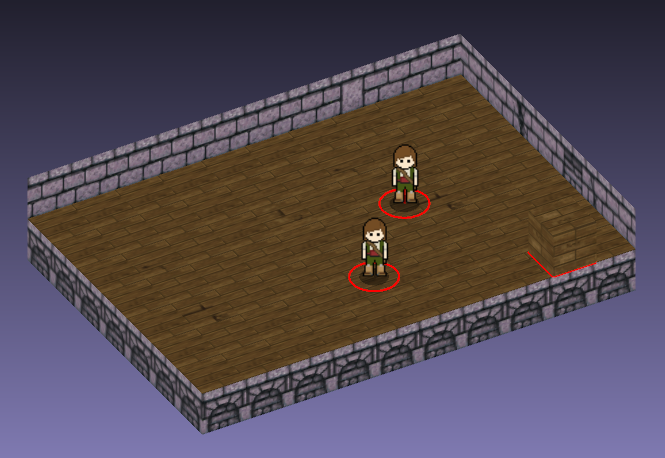 The next feature (which technically isn’t displayed here) is the addition of an NPC system. 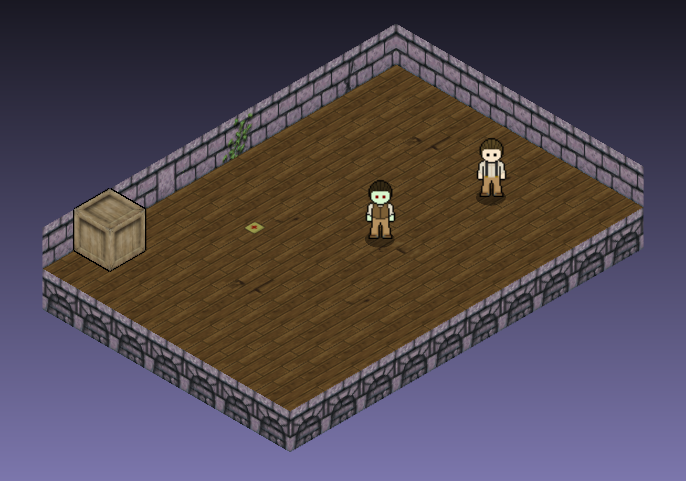 The second character in the scene is an NPC that you can walk up to and initiate a chat dialogue with. This dialogue system is powered by flexible scripted chat files. 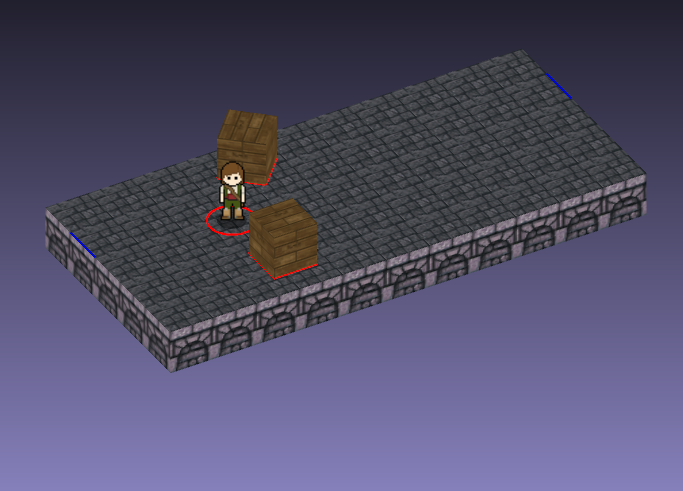 My next moves will probably be to add AI logic to the NPCs so I can create enemies. I will most likely also import the particle effects I had created for my turn-based game and let the level scripts control them. Next on the to-do list is to add a better input control system. I have some code that will allow players to use XBox 360 controllers as input for this, which should be really neat. So I’ve finally set my code projects back up. The power supply on my dev box died about a month ago, so I bought a new laptop to fill in while I replaced it (long story). Anyway, now I have my projects running again. 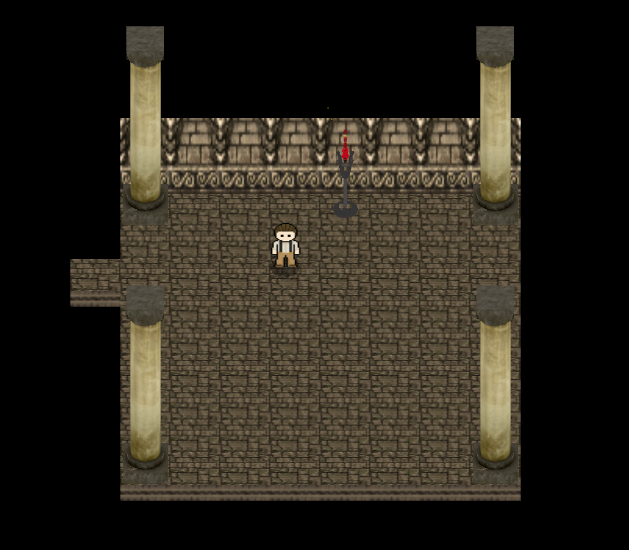 Having not seen my game/game engine working in a while, it feels great to see my demo going. It almost makes me think that I could release a full game with it soon. We’ll see though. I’ve been considering making a couple themed demos just to ensure that all the features I’d need in the future are there. One of the leading ideas for this is a Lord of the Rings Tactics demo. It would feature big scenes such as the Balin’s Tomb skirmish, etc. The idea is to mimic an already well-defined scene so that it’ll be easier when I go to design a full game.